I was finally able to catch The Big Sick, just as it’s starting to leave theaters after a limited run. But let me tell you this, before we get into it, you need to find the nearest theater playing this and go see it. Don’t wait! By the time you get to the end of this review, it might be gone! GO NOW! Comedian Kumail Nanjiani stars as himself, telling the story of how he met his wife Emily (in the movie played by Zoe Kazan). 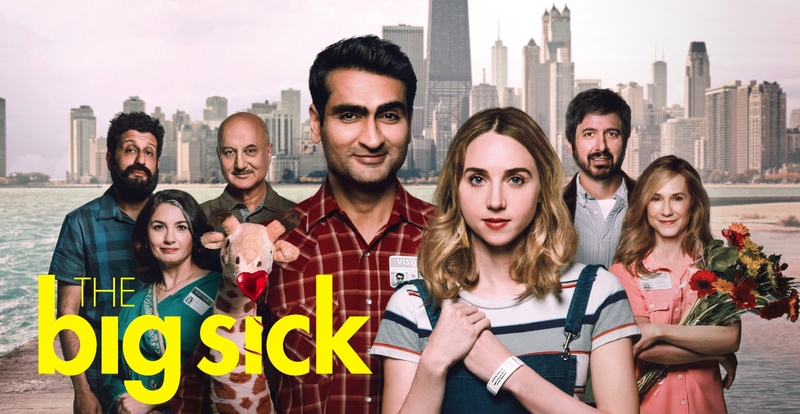 At the end of the first act, Emily ends up in a hospital, in a medically-induced coma and Kumail has to struggle with his own issues, his restrictive Pakastani family that want him to get an arranged marriage, and convincing Emily’s parents (Ray Romano and Holly Hunter) that he’s a stand up guy. We also have some fellow comedians in supporting roles, including Bo Burnham and Aidy Bryant (Saturday Night Live). This movie is a pleasant surprise and one that I wish more people could experience. Since it’s already on its way out of theaters, I’m hoping it gets a strong second wind on streaming services. In terms of genre, it very much fits in the mold of indie rom com, hilariously funny but also real and raw and manages to feel like we’re peeking into the lives of other people. It probably helps that Kumail lived all of this before and that the script is actually co-written by the real Emily Gordon as well. Let’s start with the comedy. Kumail is an incredible talent, if you haven’t seen his work before. He’s witty and sharp and yet understated enough that sometimes jokes even slip past you. He’s surrounded here by other comedic talent, including Aidy Bryant and Bo Burnham (who I’ve been a fan of since he was making YouTube videos in his bedroom). I laughed harder in this movie than I’ve laughed in a long time. Somehow this balances with a heavy amount of tragedy and heartbreak. You wouldn’t think a comedy would mostly take place in a hospital waiting room, but this one does. I would laugh and then turn to tears in moments, this movie beautifully weaves the two emotions together in a way that doesn’t often work. I wasn’t expecting this movie to pull at the heartstrings like it did but it manages to do so because it feels real. Life is uncontrollable and awkward and beautiful and this movie captures all that. There are conversations in here that I’ve actually had with people, moments of awkwardness that I’ve experienced. There is love and loss and it all feels authentic. Part of this success comes from Emily’s parents, played in the movie by Ray Romano and Holly Hunter, who deliver incredible performances. I could see Romano getting a Best Supporting Actor nod for this role, as he gives a very nuanced performance that is refreshing, from someone I maybe underestimated. The biggest downside to me was that it does feel fairly predictable, especially considering it’s based on a true story. The plot points are fairly cliche, though it’s the charm and dialogue and the specific moments that feel authentic, so I didn’t mind too much. The Big Sick is great, full of hilarious banter, gutwrenching heartbreak, and charming yet authentic interactions. Everyone across the board delivers outstanding performances in a movie that I’ll likely place in my top 10 of the year. If you can, try to find this movie ASAP, though I’ll remind you all when it arrives inevitably on streaming services soon. This entry was posted in 5 Stars, Movies and tagged adam ryen daniels, aidy bryant, bo burnham, comedy, emily gordon, holly hunter, i am your target demographic, iaytd, indie, kumail nanjiani, movie, movie review, movie reviews, movies, ray romano, review, reviews, the big sick, zoe kazan. Bookmark the permalink.